Danske Bank is embroiled in a money laundering scandal that has triggered criminal investigations, forced out its CEO and chairman and rattled investors in Denmark's largest bank. An internal investigation, published in September, charted how 200 billion euro ($229 billion) flowed through Danske Bank's tiny Estonian branch from clients registered or incorporated in countries including Russia and Britain between 2007 and 2015. 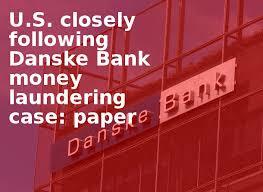 Danske Bank said many of the payments were suspicious. The following timeline summarizes developments, some of which were highlighted in an 87-page report by Danish law firm Bruun & Hjejle, which led Danske Bank's internal investigation into the allegations. Nov. 19: Whistleblower Howard Wilkinson testifies at Danish parliament. Oct. 17: Denmark's regulator, the Financial Supervisory Authority (FSA), rejects Danske's chosen successor to departed CEO Thomas Borgen as too inexperienced. Oct. 4: Danske says the U.S. Department of Justice has launched a criminal investigation into its Estonian branch, which could lead to a crippling fine. Many non-resident accounts were held by entities or individuals in Russia, which is the subject of U.S. sanctions. Sept. 26: Danish newspaper Berlingske names Briton Wilkinson as the whistleblower who helped reveal the scandal. In an email to the paper, Wilkinson confirms his role. Sept. 19: Danske publishes the Bruun & Hjejle report, revealing that payments totaling 200 billion euros had flowed through its Estonian branch between 2007-2015, many of which it says were suspicious. Borgen, who was in charge of Danske Bank's international operations, including Estonia, between 2009 and 2012, resigns. The report said he had not breached his legal obligations. Jesper Nielsen, the head of Danske's domestic banking business, is appointed interim CEO around two weeks later. July-August: Estonian and Danish prosecutors launch criminal investigations in the wake of a complaint by Bill Browder, the chief of asset manager Hermitage Capital. Once the biggest foreign money manager in Russia, Browder has led a vocal campaign against the Kremlin. May 3: Denmark's FSA criticizes Danske's handling of the Estonian crisis and orders it to reassess its solvency needs, strengthen governance and review management in Estonia. It stops short of action against anyone under its fit and proper rules. Dec. 2017: Danske fined 12.5 million Danish crowns ($1.9 million) by a Danish public prosecutor for violating anti-money laundering rules. Sept. 21, 2017: Danske says it has "major deficiencies in controls and governance that made it possible to use Danske Bank's branch in Estonia for criminal activities such as money laundering". Follows a report prepared by US-based consultancy Promontory Financial Group. The bank expands an investigation into its Estonian branch. March 2016: Denmark's financial regulator says it has reported Danske to the police for breaching anti money laundering rules and censures it for not having identified and reduced "significant money laundering risks" in its Estonian branch. End-2015: Danske shuts the bulk of its non-resident portfolio in Estonia. From 2007-2015, there were around 10,000 customers in total in the portfolio, the Bruun & Hjejle report said. Feb. 3-6, 2014: The bank conducts an on-site audit in Estonia. In draft conclusions sent by email on Feb 5, 2014, it says: "we cannot identify actual source of funds or beneficial owners", the law firm's report said. The report adds that a branch employee had "confirmed verbally ... that the reason underlying beneficial owners are not identified is that it could cause problems for clients if Russian authorities request information." Dec. 27, 2013: A whistleblower, working at Danske's Estonian branch, emails a first report, entitled "Whistleblower disclosure - knowingly dealing with criminals in Estonia Branch", the Bruun & Hjejle report says. It was sent to managers on the bank's executive board, at group compliance & anti money laundering and in internal audit. The whistleblower said the accounts of a customer at the Estonian branch were closed in Sept. 2013. "Apparently it was discovered that they included the Putin family and the FSB (Russian Federal Security Service)," the law firm quoted the whistleblower as saying in the email. The Kremlin had not replied to repeated requests for comment about the allegations from Reuters. The whistleblower reports more customers with "similar irregularities" to Danske's group internal audit department between Jan. and April 2014, the law firm's report says. 2013: A correspondent bank stops clearing dollar transactions out of Danske's Estonian branch because of money laundering concerns, Bruun & Hjejle report says. Aug. 2008: Danske abandons a costly plan to migrate its Baltic banking activities onto the group IT platform. As a result, the Estonian branch does not use the anti-money laundering procedures, transaction and risk monitoring developed at group level, the Bruun & Hjejle report said. June 8, 2007: The Russian Central Bank writes to the Danish financial regulator, voicing concerns that clients of newly-acquired Sampo Bank "permanently participate in financial transactions of doubtful origin" estimated at "billions of rubles monthly", the Bruun & Hjejle report says. The letter is forwarded to Danske's executive board and board of directors. The Estonian regulator also issues a critical inspection report, the law firm says. Nov. 2006: Danske buys Sampo Bank, Finland's third-largest bank, which has businesses in countries such as Estonia, Latvia and Lithuania. The acquisition is completed in Feb. 2007. · The investigation identified a total of around 10,000 customers as belonging to the non-resident portfolio. To ensure that all relevant aspects are covered the investigation covers a total of around 15,000 customers with non-resident characteristics (that is, a further 5,000 customers). · The around 10,000 customers carried out a total of around 7.5 million payments. · The around 15,000 customers carried out a total of around 9.5 million payments. · For all of the customers covered by the investigation, that is, around 15,000 customers, the total flow of payments amounted to around EUR 200 billion. · At the present time, the investigation has analysed a total of some 6,200 customers found to have hit the most risk indicators. Of these, the vast majority have been found to be suspicious. That a customer has been found to have suspicious characteristics does not mean that there is a basis for considering all payments in which the customer in question was involved to be suspicious. Overall, we expect a significant part of the payments to be suspicious. · The portfolio of the non-resident customers in Estonia was closed down in 2015 (a few accounts were closed at the beginning of 2016). As part of our strategy, we will serve only subsidiaries of our Nordic customers and international customers with a solid Nordic footprint. · Governance and oversight in relation to the Baltics have been strengthened with the introduction of a new pan-Baltic management. · The independence of control functions in the Baltics has been strengthened and processes and controls have been raised to Group level to ensure the same level of risk management and control as in other parts of the Group. · The Baltic units have been migrated to a single shared IT platform, which enables increased transparency and oversight. · initiated a comprehensive AML programme, which has led to major changes in the form of new organisational structures, new routines and procedures, as well as the implementation of new IT systems. · strengthened and will continue to strengthen the compliance knowledge and culture across the organisation, among other things through a strong management focus and extensive mandatory training. Over the past twelve months alone, internal and external training service providers provided almost 70 different AML training courses across the organisation. Approximately 20,000 employees have been given training. · implemented risk management and compliance in performance agreements of all members of the Executive Board and senior managers. · strengthened the whistleblower setup by transferring the responsibility for investigating reports to Group Compliance and implementing a stronger governance setup to handle reports. Furthermore, we have increased information about the whistleblower system to all employees and introduced mandatory training. · generally strengthened the three lines of defence, which also includes ensuring increased independence of control functions and making sure that whistleblower reports and correspondence with supervisory authorities form part of reporting to the Board of Directors. · We have recruited a new Chief Compliance Officer with broad international experience. He will become a member of the Executive Board when he joins us no later than 1 December 2018. · We have implemented the extra Pillar II capital requirement of DKK 5 billion and have increased the target for the total capital ratio to "above 19%". · The Group has carried out an assessment of management and governance in the Estonian branch. · Integration of compliance as a fundamental part of our culture at all levels. · New initiatives and procedures to ensure that indications of potentially problematic issues are sufficiently investigated escalated in a timely manner and handled effectively. · We will establish a central unit at Group level to ensure transparency and completeness in Danske Bank’s interaction with the FSA and due, timely and qualified reporting.